Our column covers are made up of specially designed rigid filaments with moulded sliding guides, with very high abrasive resistance finish. 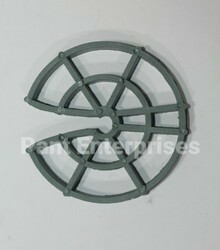 This cover block can provide a cover of 20/35/40/45/50mm. very helpful as it can be tied. Can be tied to the reinforcement to avoid slippage. We are among the prominent organization in the industry for offering a wide assortment of 25mm Column Cover to our valuable customers. They are used for side application to Rings in pile foundation. They are provided without cut for easy loading. Size :- 35mm, 40mm, 50mm. Usage :- 8 nos / RMT. Column Cover & Room Divider. We have put forth for our clients a wide range of column covers that provides a durable cover to structural supports and duct work. Being precision designed, these covers can be directly attached to sub-framing system consisting of steel studs & clip angles and steel columns & concrete columns.